Two ugh projects in a row! First up: my aunt's pointy-edged tam. Its initial problems were partially resolved by blocking (yay for Soak and again for the incredibly useful giant Tupperware bowl, which is also great as a cover for rising bread dough and as a spinny place for yarn that's being measured for yardage.) Once it was dry, though, more problems emerged. You know how a squirrel can hold like a million nuts in its cheeks? Well, the bottom of this tam could hold about a million squirrels with a million nuts in their cheeks. Fail. Next: the Great Malabrigo Experiment. I have resisted Malabrigo since falling off the no-knitting wagon last fall (I was heavily addicted in the 80s and early 90s, and recovered until Karen and Kathi lured me back.) If you're going to be spoiled for anything else, it's best to be spoiled by something less expensive than Malabrigo. Then I got to see some and feel it and was tempted... except that there really weren't any colours I liked. And then, a few weeks ago, I found a skein whose colours I love. But I've been knitting it into a Thing the last two days and you know what? I don't love the way the colours fall. They're kinda blotchy - nothing like a stripe, nothing like a soft blur. More like somebody threw down a bunch of pastel powder in a fit of pique and stomped away. 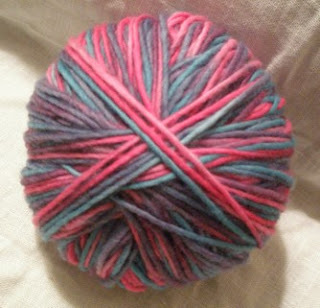 And the Thing never took shape into anything but that before I ran out of yarn. I haven't improvised a single thing in the past four months without having yarn left over, so I was totally unprepared for that. Being stoic, I'm going to treat it like a swatch and measure the heck out of it and then roll it all back into a ball to do what with, I don't know. I think only felting will give me the colour blur I wanted and a bag is kind of a waste of Malabrigo, don't you think? It's too soft not to be touching your skin. So. Learning experience: pairing stitches to shapes is very important, and so is checking yardage before beginning, and swatching not just for size but for colour when working with variegated yarn. I just hope my next crash course in disaster avoidance takes less than 12 hours. a felted malabrigo hat, perhaps? Mitts? Don't you hate when that happens? I love me some variegated yarn, but find that it sometimes looks nicer on the skein than in the knitting. But, hey, this is a process. And if it were all smooth, it would be much less interesting. That is what I tell myself when disaster strikes.